While The Lodge today sits at the center of the world-famous Nemacolin Woodlands Resort, it was once the peaceful hunting lodge of the Pittsburgh industrial titan, Willard F. Rockwell. Constructed in 1968, its immense popularity among his loved ones inspired Rockwell to turn the building into a vacation spot open to the public. The location’s ascent into a world-class luxury resort continued under the ownership of the Hardy family, who purchased the lodge and its accompanying land in 1987. Originally intending to use the site as a private family retreat, Joseph A. Hardy III and his daughter, Maggie, decided instead to transform the area into the Nemacolin Woodlands Resort. The Hardys added many new facilities—like a professional 18-hole golf course, a world-class spa, and several outdoor adventure centers—and thoroughly renovated the ones that already existed. The original hunting lodge underwent a significant rehabilitation too, becoming “The Lodge at Nemacolin Woodlands Resort” in the process. The exquisite accommodations at The Lodge at Nemacolin Woodlands Resort act as a wonderful time capsule ferrying guests back in time to when the building was just a country manor hidden away within the dense wilderness of Western Pennsylvania. These fantastic guestrooms feature the finest luxuries, including the latest audiovisual technology, complimentary refreshments, and designer toiletries. The Lodge also features its own stunning dining establishment called Rockwell’s, named in honor of the building’s original owner. This superb restaurant epitomizes the bucolic culinary heritage of the Laurel Highlands. Nearby, the Woodlands Spa & Holistic Healing Center provides for a soothing environment in which to purge the mind and body of all its stress. The Lodge is also surrounded by more than 25 different conference venues that are perfect for hosting any kind of memorable get-together. A fixture in the Laurel Highlands for over half a century, the Nemacolin Woodlands Resort is one of the nation’s most exciting vacation getaways. Guests who stay at The Lodge will discover a near endless array of interesting attractions that will provide for hours of entertainment. Several sensational outdoor activity centers call the resort home, like the Nemacolin Field Club and the Wildlife Academy. Open year-round, these electrifying venues grant for wonderful opportunities to experience the majesty of the surrounding Laurel Highlands. The resort is also the site of many fabulous indoor recreation facilities, such as upscale storefronts, art galleries, and a brand new casino. Dozens of impressive historic landmarks reside just a short distance from the Nemacolin Woodlands Resort as well, including Fort Necessity and the Flight 93 National Memorial. Without a doubt, The Lodge and its resort are both amazing places to visit. 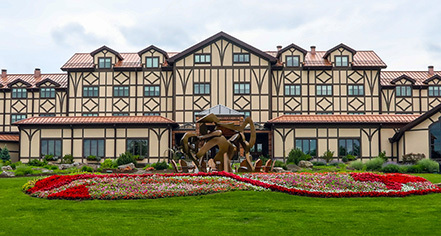 The Lodge at Nemacolin Woodlands Resort, a member of Historic Hotels of America since 2018, dates back to 1968. The name is derived from the great Native American Chief, Nemacolin. Nemacolin and his companion, Thomas Cresap, carved a wilderness trail near the site of the current resort during the 1740s. That pathway eventually became the National Highway, and then U.S. Route 40. ATM: On property next to The Pantry. Cancellation Policy: Seven (7) day cancellation notice. Deposit: One (1) night deposit is required at time of booking. Early Check-In/Late Check-Out: Early check-ins are available upon request. Late departures are available at $100 per hour. Extra Person Fees: Three (3) or more persons - $50 per person. Hotel/Resort Fees & Taxes: Resort fee of $39 per night; guests will be charged for occupancy tax, hotel tax, and sales tax. Occupancy Restrictions: All rooms have a maximum of four (4) people per room. Parking: Self-parking and complimentary valet. Payment: All credit cards, gift certificates, and/or cash. Pet Policy: No pets allowed; service animals allowed. Smoking Policy: Property is non-smoking; smoking allowed in cigar bar. 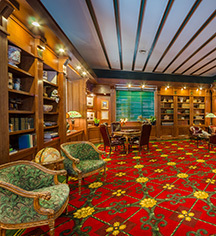 Learn more about the History of The Lodge at Nemacolin Woodlands Resort .